Under spreading trees, in private houses and within tents early Columbiana County residents worshipped God publicly and heard the preaching of the Gospel. Always its religious atmosphere grew and proved an inspiring and comforting impetus throughout the multitudinous vicissitudes of the initial phase of its existence which, in its mature years, has established it as a community of high moral tone, one inculcated in Christian doctrine and given to a breadth of equity in the varied human relationships of its inhabitants. It was a Methodist minister, Rev. Robert Dobbins, of Yellow Creek, who preached first to an East Liverpool audience which, few in number, greeted him in the open in 1799. He filled in at every opportunity. Then, from Calcutta, came the Presbyterian preachers, Revs. Thomas E. Hughes and John Scott, who, as evangelists, had with others been holding revivals throughout the outlying settlements. Episcopalians erected the first church within the present city confines and the Roman Catholic Church followed with the second built structure. Then, in turn, as the population mounted the various denominations became active in organization and resultant building of places of worship until by 1925 East Liverpool has more than 35 church and missions, some fitted with every modern appointment and all carrying a value exceeding $1,000,000, with a total membership of more than 12,000 in all the different denominations. Although there is no firm basis for determining the effects of churches on a community, organized religion had a stabilizing effect upon the residents and the town. Even though Thomas Fawcett was a Quaker, there is no record that a meeting house was ever established in his village. The religious needs of the residents were probably met by transient preachers who held services and then moved on to other locations. Spurred on by the "Great Awakening," several Protestant groups organized congregations and constructed churches in East Liverpool during the 1830s. The first group to organize was the Episcopals in 1834. In that same year, the group built the first church in town on the Fourth Street lot donated for religious purposes by Fawcett, Moore, and Pemberton.136 Horace Mack, who was able to interview residents, states that a Methodist Episcopal group began to organize in 1827. In July 1837 James Blakely, true to his word, gave Abel Coffin, William Phillips, John Patrick, Jesse Johnson, and Richard Manley land next to lot number 121 in the town" . . . for a meeting house and residence for their preacher . . ." The trustees immediately began the construction of a church. In April of 1833 Blakely also gave a lot in the vicinity of the town (now Fourth and Monroe Streets) to the trustees of the First Presbyterian Church.139 This group incorporated themselves in 1840, but delayed the building of their sanctuary until the next decade. As this 1876 photograph show there were four churches relatively close to one another. The church shown in the photograph on the far left is the Methodist Episcopal Tabernacle. It was located on the corner of Jackson and 5th Street. One block south of the church mentioned above and half a block to the left is a small white building which would be St. Stevens Protestant Episcopal Church. The church in the center is the First United Presbyterian Church located at the corner of Market and 5th Street. The church on the far right is the First Presbyterian Church. This particular photograph from 1898 shows seven churches in close proximity. A couple of them are hard to see but they are in the picture. Starting at the far left is the (1) Methodist Episcopal Tabernacle. Directly below it, about two blocks, you can see the (2) St.John's Lutheran Church on Third Street. Letting your eye move to the left a little ways you can easily see Third Street School and directly behind it and a little to the right is the (3) St. Stephens Protestant Episcopal Church.Looking almost directly up you can see (4) St. Al's Catholic Church. Looking right, almost in the center of the picture but slightly to the left of the third church is the (5) Methodist Protestant Church. It appears as if the Methodist Protestant Church and the next church as you continue looking right are touching but in fact there are a couple buildings between them. That church is the (6)First United Presbyterian Church. The last church , at the far right, is a rebuilt (7)First Presbyterian Church which was located at the corner of East 4th Street and Mulberry Alley. The same three churches are visible. Far left the Methodist Church, slightly to the right of center is the MP Church and the First United Presbyterian Church is at the far right in the Photograph. By 1912 that building was no longer owned by a religious denomination and the church was no longer used as a church. The other two in the picture still are active churches. The pastor was Rev. Edwin Weary, who continued as such until 1902. Then followed in turn, Revs. Robert Kell and Lionel C. Difford. The former, going to Baltimore, Md., in 1919, was succeeded by the latter who remained in charge until his demise on Jan. 26, 1926, following a year's illness. He was buried in Riverview Cemetery. At the annual meeting of the church on Feb. 2, 1926 the old vestry was re-elected as follows: senior warden, Albert Carnes; junior warden, W. H. Thompson; treasurer, R. A. Weinhardt; clerk, George Steel; financial secretary, Clifford Hindley, R. J. Shepherd, A. M. Burns, Robert M. Cartwright, John B. McDonald, Charles Nelson and John Parker. Methodists during the early East Liverpool days first held their services in the various homes of those belonging to their denomination. Then followed meetings in the initial hewn log school house on the present site of Central School Building on Fourth Street which were in charge of the circuit riders of that period. In 1827 the Rev. George Brown, of Wheeling, W.Va., organized the first Methodist class at the home of Claiborne Simms, Jr. It consisted of Mr. and Mrs. Jesse Johnson; Mr. and Mrs. James and William Warrick; the Fawcett Sisters, Mr. and Mrs. Claiborne Sims, Mrs. Robert Fawcett, MR. and Mrs. Simeon Johnson, Mrs. Nancy Anderson, Mr. and Mrs. William G. Smith, Mrs. Abagail Smith, Mr. and Mrs. Samuel Lyon, John Lyon, Mr. and Mrs. Able Coffin, Mr. and Mrs. Benjamin Davidson and others. Then followed the forming of the Sunday School with Jesse Johnson as initial superintendent. One of the earliest singers who often led the music in the class meetings was Mrs. Nancy Anderson. She also combined the work of village nurse and church janitor in her effort to aid the work then being done. Here, in one of these religious sessions, Adam Poe, son of the famous Indian fighter, became convicted of his sins and later was converted as he rowed home across the Little Beaver Creek. He later became a Methodist preacher. By a strange coincidence the Fifth and Jackson Streets lot, at least 50x90 feet of it on which the original Methodist Church stood was procured from a Catholic, James Blakely, who was associated with William G. Smith, grandson of the town's founder, in the real estate business. Both wished to further the interests of Christianity in the community. They donated a lot, that on which part of the Vodrey pottery now stands to the Catholic residents and certain other property was traded to Mr. Blakely for the Methodist plot. Thus, Mr. Smith donated the site for the initial church in 1836 when he was 33 years of age. In the following year a square edifice with a stone basement and an upper section of brick was thereon erected. With the old log school house dilapidated the members began holding services in the basement ere the remainder of the structure was completed. This was continued for several years since sufficient funds for its completion were not forthcoming. William Phillips and his wife, Susannah Phillips, who lived at the present site of Dixonville, mortgaged their farm to raise the necessary money. Accordingly the church was generally known as "Father Phillip's Church." Among those aiding in these basement services were the Bennett brothers, who operated the first pottery in the city. Edwin Bennett, who later removed to Baltimore and lived to be the oldest manufacturing potter in America, frequently preached in these meetings, he having qualified as a local preacher. This church would become known as the First Methodist Church. Initially we had the following two pictures as being the interior of the Methodist Protestant Church. Bradley Bonam, the current (May 2013)organist at the First United Methodist Church of East Liverpool informed us that thess pictures were in reality the interior of the Methodist Episcopal Church. A few day latewr, as time presented itself, we were able to lay all the pictures we had of both churches, including the fire pictures found in Part 3 of this article side by side, reread all the historical text we had and determined he was correct. We thank Mr. Bonam for bringing this to our attention. This particular picture of an existing picture, we found in one of the rooms of the church, was taken by us on June 16, 2012 when we photographed the exterior and interior of the First United Methodist Church of East Liverpool. It had sat in a file on our computer until we returned to those pictures just a few days ago to create a 5 part article on that church for the web site. In the process of doing that we once again run across this picture which aided in determining where the other two pictures above belonged. A new First Methodist Church would be built on the same spot to replace that one above. In 1827 Claiborn Simms, Sr. hosted a meeting for a small group to hear a Methodist Circuit Rider from Virginia on beginning a place of worship here. The group organized a class, and was granted permission to use the log school house which stood on the hillside south of the present Carnegie Public Library. The first Methodist Society was formed in East Liverpool. A lot on 5th and Jackson Streets was donated in 1836 by William G. Smith. Construction began the following year. When work on the church progressed enough, services were held in the basement. A resolution was passed in 1872 to erect a new church on the old site. The adjoining 60 feet of frontage on 5th Street was purchased by David Boyce for $500. At this time the congregation worshipped in a building across Jackson Street known as the Tabernacle. The new church was completed and furnished, and a parsonage was erected. It was during this time that the Dorcas Society was formed comprised of the middle aged and elderly women of the church. Sorosis was organized the following year to interest young women in church work. By 1887 East Liverpool was growing from the expansion of the pottery industry. The first church helped establish the Pennsylvania Avenue Church in East End. At the turn of the century, the Rev. Milton B. Pratt was named pastor. Between 1908 and 1910 two more congregations came into being. One built a small chapel on land donated by David Boyce and located in the upper part of East End. The church was known as the Boyce Methodist Church. The second mission was started on Sheridan Avenue in the West End which was named Anderson-Methodist Church. When Dr. Isaac Wood was named pastor of the church here, the congregation began to make plans for a new church. Within a brief period of time, $65,000 was pledged towards building the new church. In 1921 work was started on razing the church building and the parsonage to make room for the new edifice. At this time the congregation worshipped on West 6th Street. 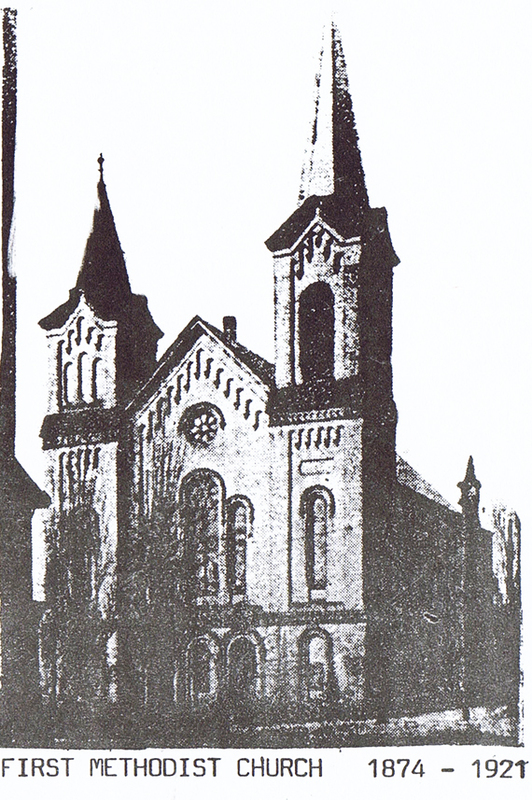 The new church was dedicated in 1922. The Women's Service League was organized at this time with Mrs. Frank Crook as the president. The Mother's Service Club was organized in 1942 and remained active throughout the war years. Extensive improvements were made to the church property in the late 1940's and early 1950's. A new parsonage was purchased on Pennsylvania Avenue, later another home was purchased at 2711 St. Clair Avenue which serves as the present parsonage. The name of the church was changed several times to reflect changes made in the general church. 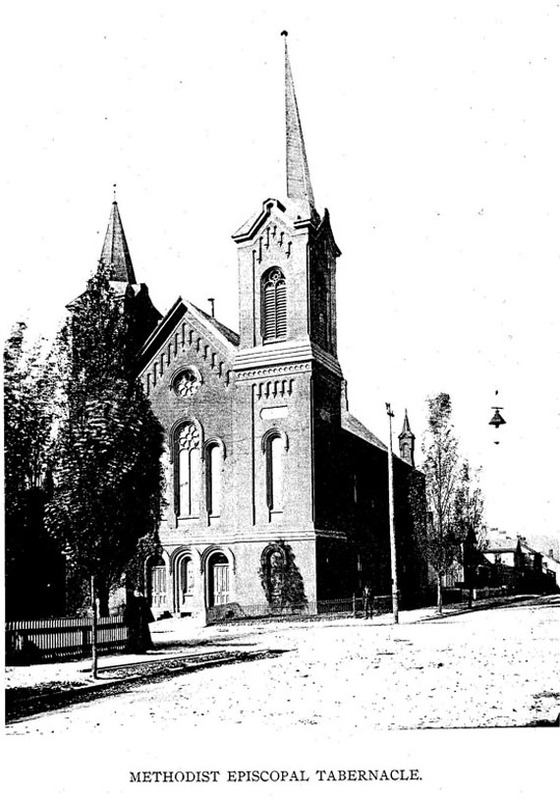 Prior to 1940 the local church was called "The First Methodist Episcopal Church of East Liverpool." and was often referred to as The First M.E. Church. The Methodist Episcopal Church merged to the Methodist Church. At that time, the name was changed to "First Methodist Church of East Liverpool". 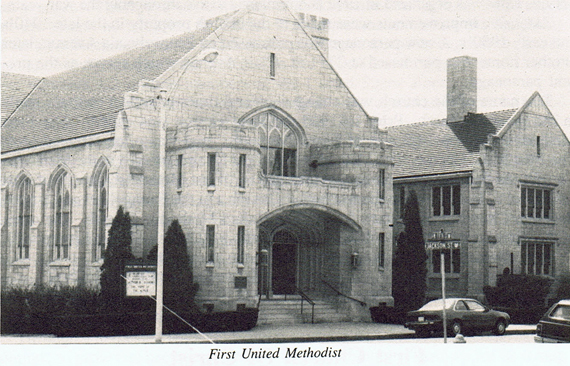 In 1968 when the Methodist Church and the Evangelical and United Brethren Churches merged to form "The United Methodist Church" the name of the church was changed "First United Methodist Church of East Liverpool". The above comes from the Sesquicentennial 1834-1984 East Liverpool, Ohio souvenir Booklet.